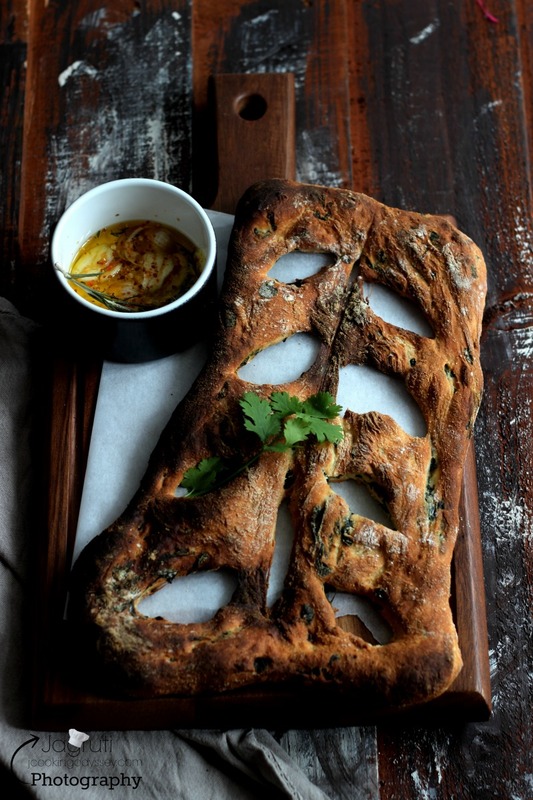 Jagruti's Cooking Odyssey: Methi and Ajwain ( Fenugreek leaves and Carom seeds ) Fougasse - East meets West ! 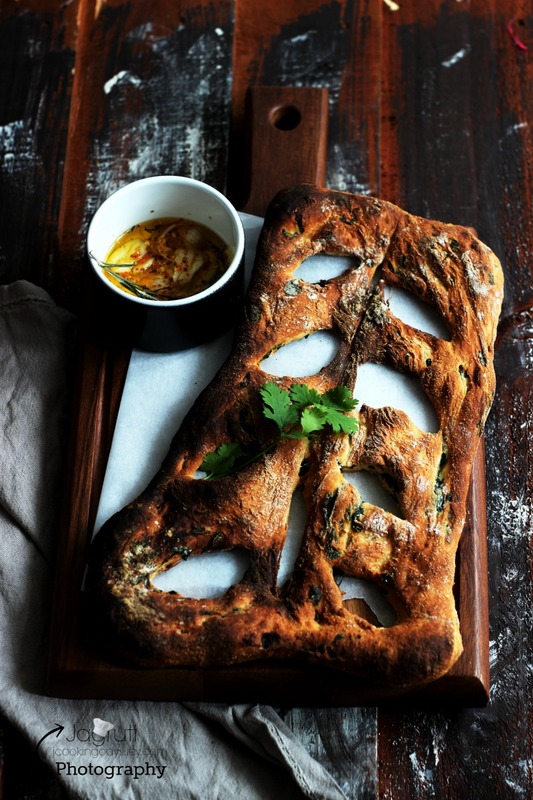 Methi and Ajwain ( Fenugreek leaves and Carom seeds ) Fougasse - East meets West ! I can't believe it, why on earth I never baked Fougasse until few months back when by chance I switched on channels and watched Paul Hollywood's baking programme which was broadcasting on BBC2, I think it was repeated programme. He was showing how to make Sour dough starter and few baking recipes using sour dough. OMG, how easy that was, oh yes, whatever he makes look so easy. I always thought that breads like fougasse, difficult to make, but when I saw Paul making it, I could not have been more wrong. 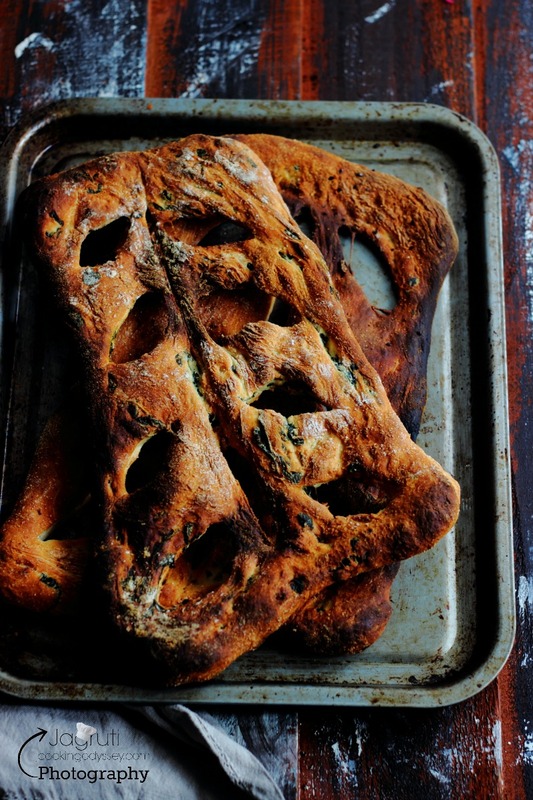 I left everything, once he started making Olive Sour dough Fougasse, there and then I decided that next morning my oven had to do work for me. While he was adding olives and oregano into dough, many things were dancing in my head. Although I was watching TV, my eyes were scanning my refrigerator to find some Desi ( Indian ) stuff..and I found something which I can never get tired of..It was Fresh Fenugreek Leaves ! Well, you all know me right ? I always want to create a recipe where one ingredient always travels from far east and meets the west :) well that's what really I am ! And next afternoon I met one of the most aromatic, rustic and bursting with flavours bread I'd ever encountered. I was so pleased with the results, fresh fenugreek leaves and carom seeds both flavours suited so well and aroma of baking fenugreek leaves was just simply divine, you can't ignore the wonderful baking aromas wafting from the kitchen ! so simple to make and yet so impressive looking, crunchy on the outside and soft inside. I would definitely say that this recipe is much easier to bake than to actually to pronounce it !! Although Paul's recipe of Olive Fougasse inspired me to bake Fougaasse, actually I did not follow his recipe as his recipe was using sour dough starter which I did not have that time, but followed his tip to use semolina for dusting. 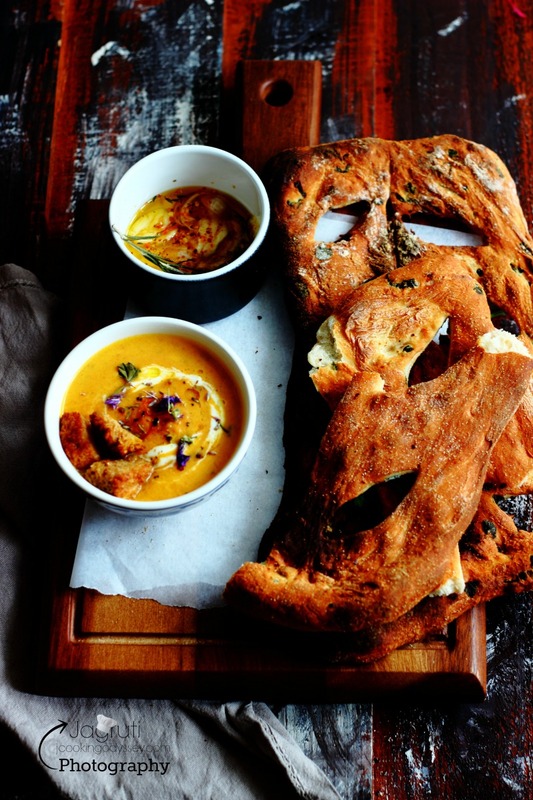 Fougasse, is a great traditional and popular French bread. It is crusty, and can be flavoured with many ingredients. It is flat and often shaped like a leaf with holes running through the surface. ( I am not sure that mine did :) ! And definitely this bread is best torn rather than slice, just pass around the table and each person will tear off the desire quantity. Generally Fougasse share along with balsamic vinegar and olive oil, but I prepared flavoured oil with mixed herbs, spices and garlic. In a big bowl place flour, easy blend yeast, sugar and salt. Mix everything with wooden spatula. Now mix 100 ml boiling and cold water, it should feel perfectly hand hot. Add the oil in water. Make a well in the centre of the flour and pour oily water all at once. 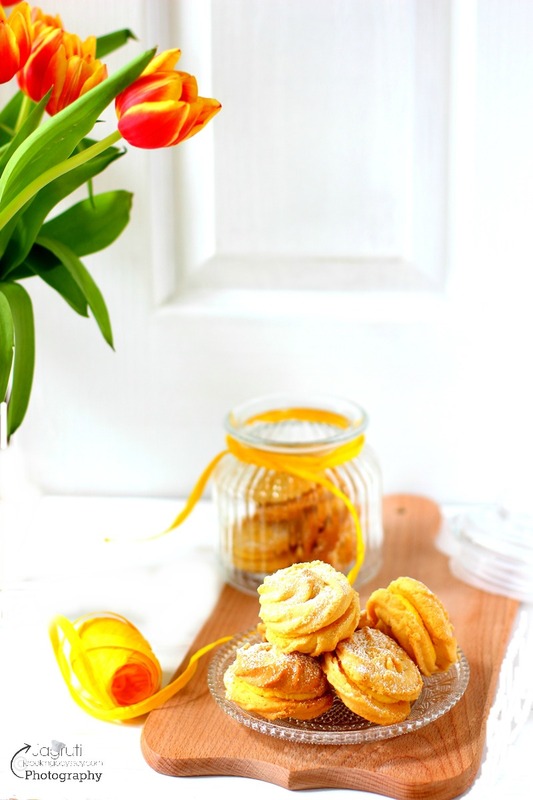 Quickly using a wooden spatula mix everything to make a soft and sticky dough. On a clean surface sprinkle flour and tip the soft and sticky dough. Mean while make fenugreek mix by heating oil in a pan. Add ajwain seeds, chilli ginger paste . Fry just few seconds and add methi leaves. Keep heat high, and let the methi cook for 2-3 minutes. Methi mixture should be totally dry. Mix semolina and dry flour to sprinkle on the surface. Now sprinkle semolina and flour mix on the clean worktop , tip the risen dough on it and lightly need in the fenugreek mix. Keep baking tray ready dusting with semolina. Cut the dough in 3-4 equal pieces. Put the dough piece on dusted baking tray and use your hands to make each peiece into triangle or rectangle shape. Now create a hole in the dough by using sharp knife, make 3-4 diagonal cuts. Carefully stretch the dough so holes open up more. Bake in the pre heated oven for 10-12 minutes.